Humans have communicated with one another in some shape or form ever since time immemorial. But to understand the history of communication, all we have to go by are written records that date as far back as ancient Mesopotamia. And while every sentence starts with a letter, back then people began with a picture. The Kish tablet, discovered in the ancient Sumerian city of Kish, has inscriptions considered by some experts to be the oldest form of known writing. Dated to 3500 BC, the stone features proto-cuneiform signs, basically rudimentary symbols that convey meaning through its pictorial resemblance to a physical object. Similar to this early form of writing are the ancient Egyptian Hieroglyphs, which date back to around 3200 BC. Elsewhere, written language appears to have come about around 1200 BC in China and around 600 BC in the Americas. Some similarities between the early Mesopotamian language and the one that developed in ancient Egypt suggests that some concept of a writing system originated in the middle east. However, any kind of connection between Chinese characters and these early language systems are less likely since the cultures don’t seem to have had any contact. Among the first non-glyph writing systems not to use pictorial signs is the phonetic system. With phonetic systems, symbols refer to spoken sounds. If this sounds familiar, it’s because the modern alphabets that many people in the world use today is a phonetic form of communication. Remnants of such systems first appeared either around 19th century B.C thanks to an early Canaanite population or 15th century B.C. in connection with a Semitic community that lived in central Egypt. Over time, various forms of the Phoenician system of written communication began to spread and were picked up along the Mediterranean city-states. By the 8th century B.C., the Phoenician symbols reached Greece, where it was altered and adapted to the Greek oral language. The biggest alterations were the addition of vowel sounds and having the letters read from left to right. Around that time, long-distance communication had its humble beginnings as the Greeks, for the first time in recorded history, had a messenger pigeon deliver results of the first Olympiad in the year 776 BC. Another important communication milestone to come from the Greeks was the establishment of the first library in 530 BC. In the year 14 AD, the Romans established the first postal service in the western world. While it’s considered to be the first well-documented mail delivery system, others in India, China had already long been in place. The first legitimate postal service likely originated in ancient Persia around 550 BC. However, historians feel that in some ways it wasn’t a true postal service because it was used primarily for intelligence gathering and later to relay decisions from the king. Meanwhile, in the far east, China was making its own progress in opening channels for communication among the masses. With a well-developed writing system and messenger services, the Chinese would be the first to invent paper and papermaking when in 105 AD an official named Cai Lung submitted a proposal to the emperor in which he, according to a biographical account, suggested using “the bark of trees, remnants of hemp, rags of cloth, and fishing nets” instead of the heavier bamboo or costlier silk material. While the technology underwent other advancements, such as metal movable type, it wasn’t until a German smithy named Johannes Gutenberg built Europe’s first metal movable type system that mass printing would experience a revolution. Gutenberg’s printing press, developed between the year 1436 and 1450, introduced several key innovations that include oil-based ink, mechanical movable type, and adjustable molds. Altogether, this allowed for a practical system for printing out books in a way that was efficient and economical. Around 1605, a German publisher named Johann Carolus printed and distributed the world’s first newspaper. The paper was called “Relation aller Fürnemmen und gedenckwürdigen Historien,” which translated to “Account of all distinguished and commemorable news.” However, some may argue that the honor should be bestowed upon the Dutch “Courante uyt Italien, Duytslandt, &c.” since it was the first to be printed in a broadsheet-sized format. By the 19th century, the world, it seems, was ready to move beyond the printed word (and no, people didn’t want to get back to advancing fire and smoke-generated messages). People wanted photographs, except they didn’t know it yet. That was until French inventor Joseph Nicephore Niepce captured the world’s first photographic image in 1822. The early process he pioneered, called heliography, used a combination of various substances and their reactions to sunlight to copy the image from an engraving. Other notable later contributions to the advancement of photography include a technique for producing color photographs called the three-color method, initially put forth by Scottish physicist James Clerk Maxwell in 1855 and Kodak roll film camera, invented by American George Eastman in 1888. The foundation for the invention of electric telegraphy was laid by inventors Joseph Henry and Edward Davey. In 1835, both had independently and successfully demonstrated electromagnetic relay, where a weak electrical signal can be amplified and transmitted across long distances. A few years later, shortly after the invention of the Cooke and Wheatstone telegraph, the first commercial electric telegraph system, an American inventor named Samuel Morse developed a version that sent signals several miles from Washington DC to Baltimore. And soon after, with the help of his assistant Alfred Vail, he devised the Morse code, a system of signal-induced indentations that correlated to numbers, special characters and letters of the alphabet. Naturally, the next hurdle was to figure out a way to transmit sound to far off distances. The idea for a “speaking telegraph” was kicked around as early as 1843 when Italian inventor Innocenzo Manzetti began broaching the concept. And while he and others explored the notion of transmitting sound across distances, it was Alexander Graham Bell who ultimately was granted a patent in 1876 for "Improvements in Telegraphy," which laid out the underlying technology for electromagnetic telephones. But what if someone tried to call and you weren't available? 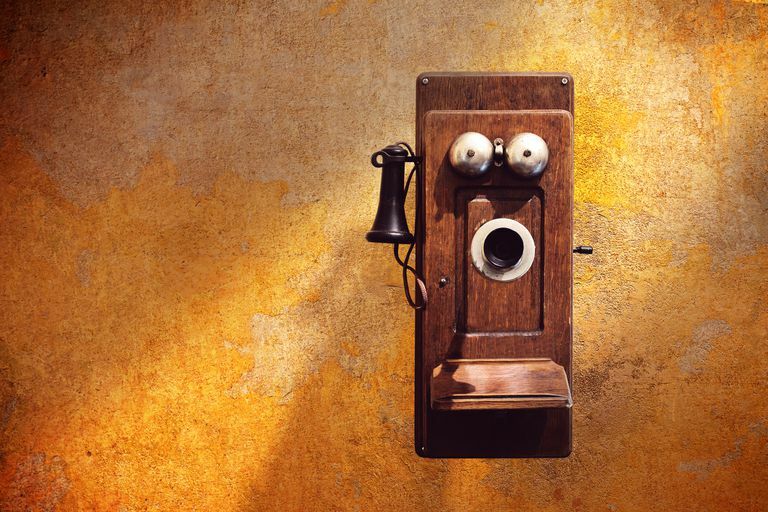 Sure enough, right at the turn of the 20th century, a Danish inventor named Valdemar Poulsen set the tone for the answering machine with the invention of the telegraphone, the first device capable of recording and playing back the magnetic fields produced by sound. The magnetic recordings also became the foundation for mass data storage formats such as audio disc and tape.